The January Siren is now online. The new year is off to a great for camp and we've got lots of news to keep you warm through any Polar Vortex you may be facing these days. The Siren is filled with information on returning staff, new and returning campers, and great small world stories as well. Enrollment continues to be strong, and you'll see the latest new and returning campers who have enrolled. We still have spaces remaining in some of our age groups, depending on session. If you know of anyone who might be interested in sending their son to North Star, let us know by completing the "Refer a Friend" form. We will be at camper recruitment events in St. Louis, Dallas and Nashville over the coming weeks and maybe more. We'd be happy to schedule home visits with prospective campers. As always, we appreciate your support and we know that our best salesmen and saleswomen are our camp families. February is a crazy month for us! Once this time of year approaches, we hit the road again with a vengeance. The next month is always filled with camper recruitment visits. It’s also when we head out, several college campuses in search of amazing staff members. We also have our annual ACA National Conference. Here is our current travel schedule with more stops to be announced. Camper fairs are in bold. If you’re interested in meeting us on one of our visits or would like to schedule a separate time to meet up when we’re in your city, let us know. 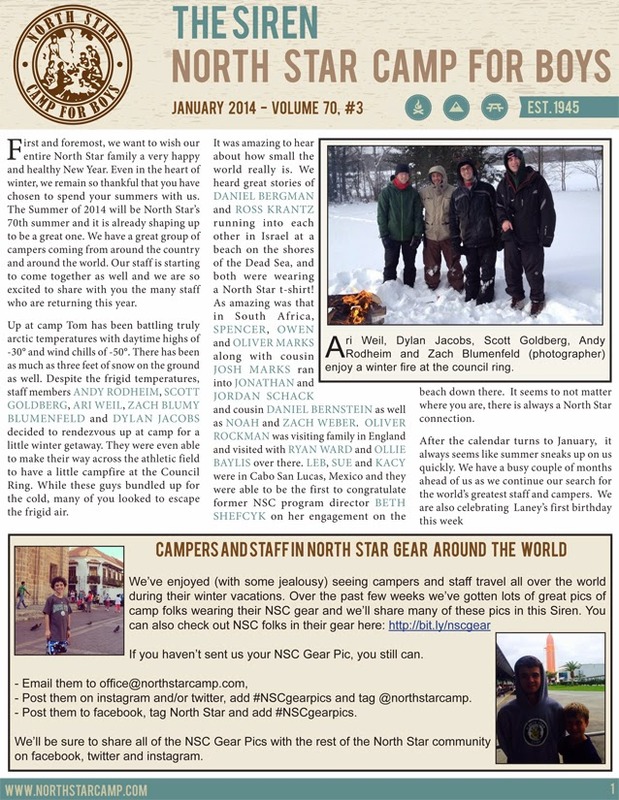 Email us at office@northstarcamp.com to find out more about our visits or to schedule an appointment. If you know of prospective campers or staff in any of these areas, be sure to let them know of our visits or let us know and we’ll reach out to them. We’re happy to schedule appointments when we’re in any of these cities. We are still planning more trips so keep an eye on the NSC blog and Facebook for more announcements! Noah Sherman is having a benefit concert at Shrinechops at 7230 Madison Ave in Forest Park on Sunday, January 12 at 5 pm. This past year the Sherman family became involved with helping a young man seeking asylum in this country. He is a victim of torture and lost his family in the Sudan. They recently received a matching grant for $2500 for tuition if they can meet that amount by January 15. They have helped raised over $1000 and Noah is going to try to help them meet this challenge. The bands include Noah's band, The Noise Orchestra as well as the jazz combo from Oak Park River Forest High School. All proceeds go to a tuition fund for Guy, a refugee from Darfur that Noah's family is assisting in his pursuit of asylum in this country. This young man survived attacks on his village and is eager to get an education so he can help others learn about what is happening in his country. Tickets are $25 for adults and $10 for students. This includes a light meal. Please contact alix_sherman@yahoo.com if you can attend. Below you can read the full story of Guy and who he is and how he came to this country. Last week marked Human Rights Day. Two of the most significant achievements of the last century were our worldwide establishment of the rights of refugees and the right to education. I am writing today on behalf of a dear friend of mine, a refugee from Darfur named Guy Adam. Guy’s parents were farmers. He had six siblings and he had to drop out of school after 4th grade to help his parents with the farm. One day in 2003 Guy’s village was attacked by members of the Janjaweed militia, a paramilitary group carrying out the genocide in the name of the Sudanese regime. Guy fled and has been missing his family ever since, not knowing if any of them are alive today, except for one brother who made it to Israel when Guy was living there in 2012. Guy had fled through Egypt to Israel where he lived for several years. I met Guy in Israel where he was my translator for a research project I did on African asylum seekers in Israel. When Guy decided to apply to colleges in the United States, I admit I did not have any hope that he would ever obtain a visa to leave Israel, as this is very rare for the African asylum seekers there. But, with much luck, Guy was accepted to attend the College of Lake County in Grayslake, Illinois and was miraculously given a Student Visa to pursue his educational goals. Guy was able to obtain his visa because a few American citizens vouched for him. To do so, I had to provide the college and the visa offices with my bank account information and to agree to support Guy during his studies here while he is on the Student Visa. On this visa, Guy is not permitted to work, so I had no choice but to move forward and find ways to support his life in the United States while he applies for refugee status. Many people stepped up to help. Tamar Shertok, a friend of Guy’s from her time in Israel as well, took Guy around Chicago and helped him settle in, even taking him to visit her family during holidays and to speak at the University of Wisconsin in Madison where her sister organized a huge fundraiser for him. Together, Tamar and I created a Fundly account for people to donate. We solicited support from friends and family to help us make sure that Guy had shelter and food to eat every day. And Tamar’s sister Becca organized the large fundraiser in Wisconsin for him on her college campus. Because Guy cannot work on his visa, we cover all of his expenses: food, rent, phone bill, health insurance, medical bills and tuition. Guy marks his one year anniversary in the US tomorrow. While the adjustment has had its ups and downs as Guy has all at once had to navigate a new country, starting college, and a new life in which he is not capable of supporting himself as he always has, Guy has worked hard and done well in his studies, and he has been helped and supported by incredible people like Alix and Jon Sherman who took Guy in during his summer vacation so he would not be alone. The good news is that this week Guy turned in his asylum application that his pro bono attorneys have meticulously worked on for the past year. It could take another year to obtain refugee status, but once Guy obtains refugee status in the United States, he will have the resources and capacity to live his life and to be a free person. He will be able to work and to sustain his livelihood. He will be able to pursue his passions for learning and for sharing his incredible story of survival and determination with others. You can also check out our website to read Guy’s full story and watch a brief video of him at www.supportguy.weebly.com. If you have any questions please call me at 818-571-3933. Thank you so much for your help and and your support. It means the world to Guy and to all of his friends and supporters.